Portadown's Gary Twigg 'and Ballymena's Gareth Rodger 'during Saturday's match at Shamrock Park. Picture: Press Eye. 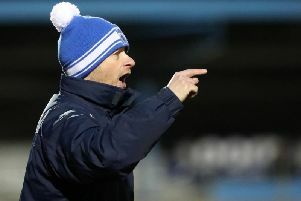 Ten-man Ballymena United suffered a 3-2 defeat to Portadown after Peter McMahon scored a late goal for the home side. The winger struck with seven minutes left to deny a point for Ballymena, who had played since the 36th minute with 10 men after Tony Kane was sent off for two bookings inside two minutes. Without teenage striker Matthew Shevlin - on international duty in Iceland with Northern Ireland under-19s - United boss Glenn Ferguson pushed David Cushley into attack alongside Matthew Tipton, while skipper Jim Ervin switched to left-back in place of the suspended Michael Ruddy. As with last season’s meetings between the sides, it didn’t take long for the goals to come as Portadown went ahead on eight minutes. Ross Redman swung in a corner and defender Ken Oman beat United keeper Dwayne Nelson to head home at the near post. Ballymena’s response was virtually immediate as they cleverly worked possession on the left hand side of the penalty area with David Cushley cutting the ball back for Neal Gawley who switched the ball onto his left foot before steering a shot past David Miskelly into the bottom corner. But barely had play re-started than the Ports were back in front. It came from a dreadful mistake by United’s on-loan defender Gareth Rodger who attempted to shepherd the ball out of play for a goal kick but he was dispossessed by Mark McAllister who cut the ball back to the in-rushing Sean Mackle. The midfielder’s initial effort came back off one of his own players but rebounded to Mackle who fired his second effort high into the roof of the net. Ballymena attempted to get back into the game and Matthew Tipton’s clever through ball put Willie Faulkner in but the winger’s effort was blocked by the chest of Miskelly. But Ballymena’s hopes were dealt a major blow when they lost full-back Tony Kane to two bookings within a two-minute spell. The first was an innocuous caution for taking a free kick before the referee’s whistle and within 90 seconds, the defender was on his way down the tunnel after felling Michael Gault in an aerial challenge. Remarkably, though, the 10 men finished the half level after fashioning a stoppage time equaliser. Matthew Tipton’s initial effort was blocked by Miskelly and fell to Cushley, who took too long to get a shot away but he eventually released the ball back to Tipton who, while on the ground, managed to bundle the ball over the line, despite the efforts of Ports defender Keith O’Hara, with the goal being signalled by the referee’s assistant. Ballymena lost substitute Stephen McBride to a facial injury early in the second period before Chris Casement tested Nelson with a 30-yard free kick. At the other end, Gary Thompson went on a slaloming run for Ballymena before laying the ball into the path of Cushley but Robert Garrett flung himself full length to block the winger’s shot behind for a corner. The second half failed dismally to match up to the standards of the opening 45 minutes but the Ports struck the decisive blow with seven minutes left. Gary Twigg played the ball into the penalty area where it was flicked by Mark McAllister perfectly into the path of Peter McMahon who ran on and struck a first time shot with the outside of his right boot which arrowed into the top corner past a motionless Nelson. Portadown: Miskelly, Casement, Oman, O’Hara, Redman, Mackle (sub Murray 75), Garrett, Gault, McMahon, McAllister, Twigg. Subs (not used): Brennan, Breen, Soares, Mouncey. Ballymena United: Nelson, Kane, Taylor, Rodger, Ervin, Gawley (sub McBride 39, sub McVey 53), Thompson, Jenkins, Faulkner (sub Henderson 86), Cushley, Tipton. Subs (not used): Magennis, Ferguson.